"warm, sweet and full, with fantastic projection...."
The love of pure sound is the main passion that drives me. Obviously the sound of the guitar is also a deep passion, as is working with wood, but I do feel that the love of sound is the original and over-riding force. This is something in me that predates my love of lutherie by many years. When one first plays a guitar, it is that initial response inside of us that has a big impact on our final decision to buy or move on. 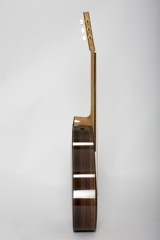 The guitar must simply be beautiful from the very beginning, both acoustically and aesthetically. My guitars have a beautiful, clear, full bodied sound, reasonably bright with enough warmth and a broad range of tonal colours to give the guitar that personal, romantic sound. With that clear seperation of notes and no muddiness, the musical message is awesome. One knows when a top is in balance, you can feel it and hear it, it just gives the sound 'something else', an added dimension. 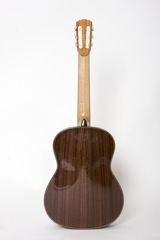 A balanced top also makes the guitar easy to play, you don't have to 'work' to make a beautiful sound. The guitar gives up it's sound very easily. For volume and projection the guitars are as good as the best, but they do achieve this without losing sound quality. There is a myth out there that a guitar is either loud or beautiful, but it can't be both. These guitars destroy that myth.... and, this is just the beginning!